Are you HIPAA compliant? - Awingu can help you! We often get the question if Awingu ‘is HIPAA compliant’. The Awingu software as such is not HIPAA compliant, nor can it be. However, it can help healthcare (service) providers become or facilitate HIPAA compliance. We made an overview of the standard specifications required and added the points where Awingu can step in. This way you can have a clear perspective how Awingu can facilitate you in becoming HIPAA compliant. 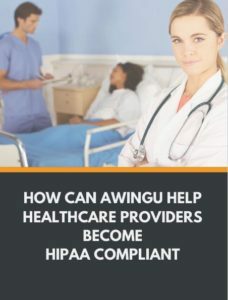 Fill in the form below and proceed to download our whitepaper to learn more about HIPAA and how Awingu can help you become HIPAA compliant.